Enter our new contest for a chance to win $250 and products that will help you buck the bottled water trend! Filters Fast wants to make sure you buck the nasty trend that is bottled water. To do so, we’ll be giving away a free product each week to one lucky fan. 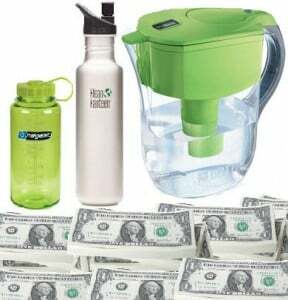 One week it might be a Klean Kanteen water bottle, or a Vapur anti-bottle, or a Brita pitcher — but rest assured, whatever it is will promote drinking filtered tap water instead of bottled water, which is bad for you, your wallet, and your world. But that’s not all — on September 1, we’ll randomly draw one fan to receive a $250 Visa gift card. Simple: All we want you to do is “like” us on our Filters Fast Facebook page, which can be found at www.facebook.com/filtersfast. Click on the “like” button just one time and you’re entered for every one of our weekly contests, including the grand prize drawing on September 1. We will post the weekly contest giveaways each Monday on our Facebook page. Weekly winners will be announced every Friday, the first Friday being July 9. Please note that you do not have to wait until July 1 to enter to win. The earlier you “like” us, the better, as you’ll be entered into each contest thereafter. You must “like” the Filters Fast Facebook at the time of each drawing to qualify. After “liking” the Facebook page, you will be entered for all of our contests thereafter. Just like us once and continue liking us, in other words, to maintain your eligibility. Filters Fast employees and their family members are not eligible for this contest. Weekly winners and the grand prize winner of the $250 gift card will be chosen at random. Definitely buy a water filter! We just moved and the water here is just awful. Thanks for the chance to win clean water!